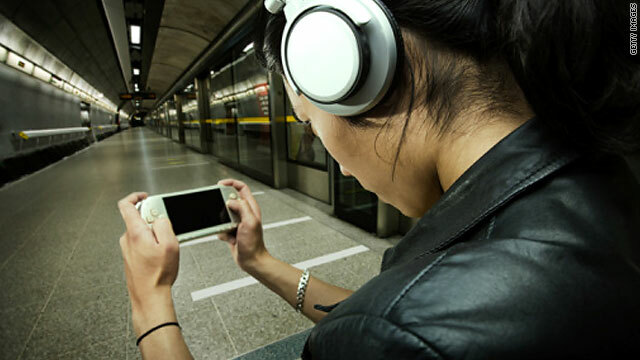 On the go, yet still connected: Smartphones and portable gaming devices entered the mainstream in 2009. (CNN) -- Engineers didn't make huge improvements to technology in 2009. The year's big tech names -- Twitter, Facebook, Google, Apple, Amazon -- all existed before January. At year's end, we're connected to each other and to the Internet like never before. In 2009, we carried tiny computers in our pockets, through which we fed the Internet constant real-time info about where we were and what we were doing. Here's a look back at how it happened. It's CNN.com's 10 biggest tech trends of the year, listed in no particular order. Think we missed something? Please let us know in the comments below. By the end of 2009, having a basic cell phone wasn't good enough anymore. Now the standard is a smartphone -- a mobile phone that also acts as a computer -- and links its users to Facebook, Twitter and the rest of the digital universe. Despite the economic recession, the smartphone market expanded. It was fueled in part by the popular iPhone but also by an increasingly diverse set of smartphone choices, including the Droid, BlackBerry and Pre. Smartphone sales worldwide for 2009 were up 24 percent compared with 2008, according to Gartner Inc., a research company. Thanks to these phones, people this year grew accustomed to sending e-mail, uploading photos and videos and posting status messages from anywhere, at almost anytime. This was the year of the Facebook mom and grandma. Founded in 2004 for college students, the online social network exploded in 2008 and might have been expected to level off this year. Instead, it went global and expanded into new and older demographics. About 70 percent of Facebook's users now live outside of the site's home base in the United States, according to statistics released by the company. The site's importance in our lives grew in tandem with these demographic shifts. Facebook now has more than 350 million users -- that's more people than live in the United States and is more than double the 150 million people who were on Facebook at the start of the year. Half of Facebook users log on to the site at least once on any given day; the average Facebook user spends nearly an hour a day on the site. Individuals became publishers in 2009, using the micro-blogging site Twitter to post instant, bite-sized updates to the world. The site was founded in 2007 but grew exponentially this year. The political ramifications of the micro-blogging trend became evident in June when Iranians used Twitter to organize and publicize protests of a disputed presidential election. The protests grabbed the world's attention. Terms related to the Iranian election made up 3 of the Top 10 news trends of the year on Twitter. Sick of lugging hefty books with you on vacation? Portable, electronic readers -- with their easy-on-the-eyes displays and ability to carry hundreds of titles without gaining weight -- started to make inroads on their hardback cousins in 2009. E-book sales brought in $13.9 million in revenue in the third quarter of last year, according to International Digital Publishing Forum, a trade organization. The same time period this year saw $46.5 million in e-book revenue -- a 235 percent spike. The Amazon Kindle, originally released in November 2007, found some competition this year with the release of the Sony Reader and Barnes & Noble's Nook. Meanwhile, libraries, authors, publishers and Google continued to haggle out the details of a settlement that could give the Internet giant permission to create the world's largest library -- online only. In 2009, it's no longer enough to search for information that was current 30 minutes or an hour ago. Now, Internet junkies look for their news, Tweets and links to be updated in "real-time," just as they are on Twitter. Search engines bought into this idea in 2009. Microsoft and Google struck deals with Twitter to pipe in or replicate its real-time search function. The micro-blogging site lets authors post short bursts of information, which become searchable the moment someone clicks send. In 2009, mobile phone customers made a strange realization: The phone isn't as important as the applications that run on it. Droves of iPhone owners downloaded games, widgets and tools for their phones from Apple. By September, just over a year after the company started selling apps through its iTunes App Store, 2 billion of the applications had been downloaded. App mania was far from limited to Apple products, though. Research in Motion, maker of the popular BlackBerry devices, launched its own app store. And smartphones that run on Google's Android system started campaigning around Android apps, which are not subjected to Apple's rigorous and somewhat controversial approval process. Remember the days when people played video games on huge TVs in their living rooms? That was so 2008. This year, gaming became mobile and social. Instead of hovering around an Xbox or a Wii, it was cooler this year to plant virtual vegetables in FarmVille or run a mobster empire in Mafia Wars -- two games that run through the social network Facebook. The iPhone and its cousin, the iPod Touch, also became popular mobile gaming platforms, shaking up the idea that video games must have great graphics and be backed by huge entertainment companies to succeed. Many of the year's popular phone-based games cost less than a buck. Government has a reputation for lagging behind the technological curve. But in 2009, the Obama Administration tried to prove that bureaucrats could be hip and tech-savvy, too. The administration launched DATA.gov, a clearinghouse of information on how the federal government works and how tax money is spent. It also backed digitizing health care records, held the country's first online town hall meeting and moved toward the more efficient cloud-computing model, which essentially outsources some storage and processing of government files to companies such as Google. Google is still the world's dominant search engine, but it faced its first real challengers in 2009 as smaller search companies came up with new ideas about the way people can and should find information online. An oddball search engine called Wolfram-Alpha made big news in the spring when it debuted as a tool that calculates the answers to user queries instead of sending Web surfers to lists of Web site links, as Google does. But the major newcomer was Microsoft's Bing, a "decision engine" that introduced new ways to sort through photos online and to search for products. Bing quickly grabbed a foothold, gaining 10 percent of the search market by the end of the year. The economic recession and a federal stimulus package prompted a old-ish idea in frugal gadgetry to take off in a new way: "smart" technology invaded homes and public works projects in hopes of making our use of fossil fuels more efficient. Smart-grid technology monitors energy use and helps steer consumption to times of day when other people aren't using much electricity -- a time when it is cheaper to power appliances and more juice is available. The federal government invested billions in a smart grid in 2009 that connects homes and apartments with power plants. Consumer-level devices took off, too. Google released a PowerMeter service that gives homeowners reports on their energy use on the Web or on mobile phones. General Electric and others promoted smart appliances, such as hot water heaters, that help further help control energy costs. Most homes didn't have smart meters in 2009, but that leaves room for plenty of expansion next year.